I know what you’re thinking, a knitting pattern? I thought you were writing novels now. I am, and we’ll get back to your regularly scheduled bookish content tomorrow, but I owed my Tiny Dino Studios YouTube subscribers a knitting pattern. I promised them a worsted weight version of the simple chunky mittens all the way back in December. And I might be slow, but I don’t like to renege on my promises. So even though my mitten knitting days are over. Here friends, is a pattern just for you. If you’re joining me from the Tiny Dino Studios knitting channel, Hello! I hope you stick around to find a little bit about The Other Lane and my other books. You can snag the prequel to The Other Lane: A Modern Fairy Tale for free when you sign up for my newsletter. Enjoy the pattern and I hope you find the videos helpful! Place half (21 stitches) on waste yarn. For right mitten, knit across 21 stitches, place seond 21 stitches on waste yarn. For left mitten, place 21 stitches no waste yarn, knit across next 21 stitches. On next round, used backword loop cast-on to cast on 21 stitches in place of the ones you put on waste yarn. This is the start of your flip top. Distribute 21 stitches over 2 needles. 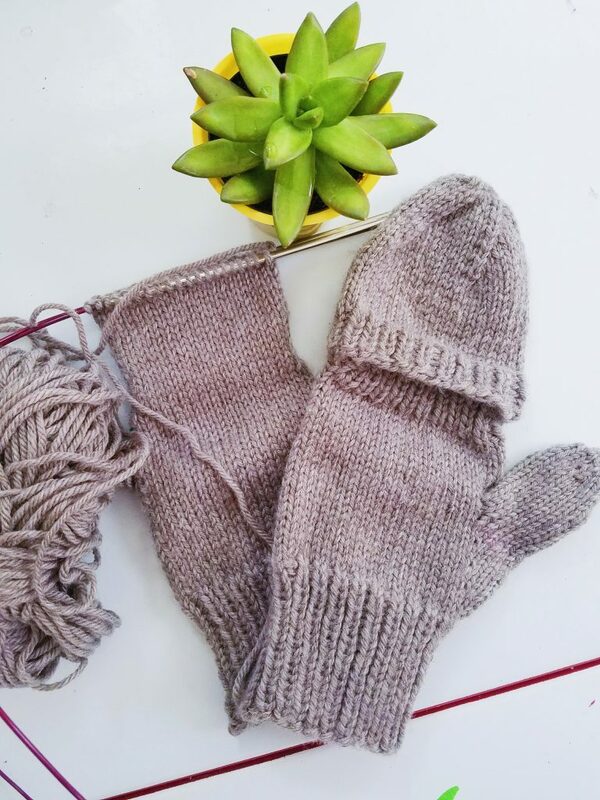 Knit in St st on the top side of the mitten and in 1×1 rib on the palm side of the mitten for one inch. Switch to St st all over for 2.5 inches or until mitten is 1.5 inches than the tallest point on your hand. Make two, making allowances for right and left hands when you are adding the flip tops. If you need any help with the pattern, please refer to the videos below, they demonstrate all the technique in easy to see, bright pink, chunky yarn. The Other Lane Cover Reveal!